Have you noticed the seasonal blooming flowers that are showing up at the supermarket? This week I found colorful primroses and miniature daffodil plants in bloom. At first I was disappointed that the primrose plants were so small, but the blossoms were so cheerful, I bought some to bring home anyway. They sat on my kitchen counter for a few days while I tried to figure out how I would display them. While watering my plants, I realized that my large terrarium was looking a bit scant and tired, so I decided that the primroses would perk it up considerably. They fit in nicely and really sparked things up! It's fun to have a little bit of spring in my living room on a January day. If you haven't already checked in from the previous post, please do! These are beautiful! Now you are going to send me out in the drizzly rain to see if my store has primroses! :) I'll have to reread your post about how to make the little containers, and make sure I put in the right things! Oh, they are so pretty! I'm really longing for spring. These little beauties really do add a feeling of spring. Thanks for sharing. Such beautiful little pieces of spring! Thanks for sharing. Isn't it interesting to see flowers in the dead of winter? I even have some that are blooming in my yard right now! I live in South Texas- so no snow here. Great idea! How I love primroses! Such a lovely Spring touch in the dead of winter! Jennifer Peterson - FB comment. Wonderful! I need to copy cat you! That is so pretty. What a great idea! I really doubt they have any flowers here in ID yet though. 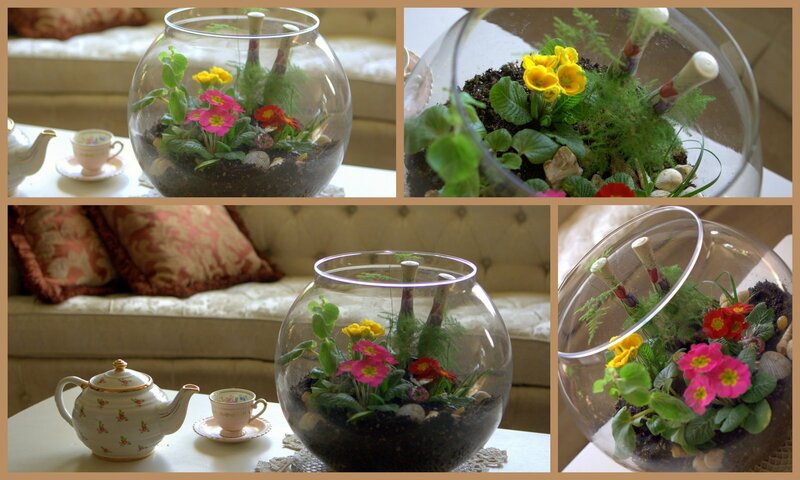 I love seeing those primroses in your terrarium. Just a breathe of Spring time for sure.